Discover Botolan’s hidden gems and allow this laid-back municipality to surprise you of its natural wonders. 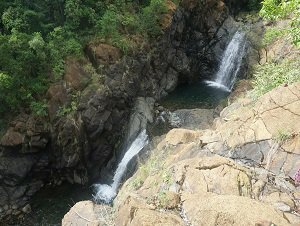 If you love going on leisurely hikes, surrounded by a wide expanse of lush pine forest, then the trek to the multi-tiered Tukal-Tukal waterfalls is perfect for you, with its cold and refreshing waters certain to relax your tired feet. 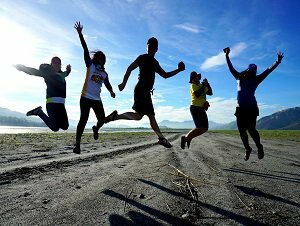 Fancy some fun under the sun sans trekking? Why not take your water-loving friends and go on a relaxed kayaking trip at Bancal river. 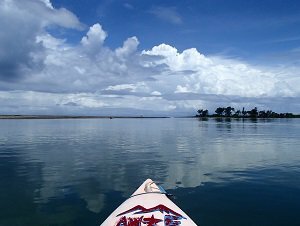 Enjoy the panoramic view of the West Philippine sea as you paddle along the mangrove area for a more intimate and serene experience. Not really a paddler? Don’t worry, there are guides who can do the rowing so you can just focus on soaking up on the positive vibe only the outdoors can provide. Those with a need for speed will surely enjoy going on an exciting ATV drive through the largest lahar field in the world. Get ready to put that pedal on the metal and power through on one of the world’s best natural racetrack. TRIPinas offers two options that will surely make it easy and convenient for you to experience the wonders of Botolan. The first option is a stand-alone package and is for those who have a limited time for exploration but wants to cover more ground. The second option is geared towards those who have signed up for a visit to Mt. Pinatubo with us and wish to extend their stay in the area. Say, you want to maximize your long weekend or want to see more of what the municipality has to offer. This can be made either one day before or the day after your hike. We also have a simple place where you can spend overnight. Whatever option you choose, we can assure you of a safe and fun tour guaranteed by our 10 years of tourism experience. 0330PM Return at the base camp. Your Botolan sightseeing trip will start with a briefing from the base camp manager at around 7:30AM. Non-essential items can be left in your vehicle on camp but make sure you have a small backpack to contain your trail food and water plus a travel towel so you can dry yourself after your swim at the waterfalls. You can already wear your swimsuit under your hike clothes (or swim in your hike clothes if you want a lighter load). 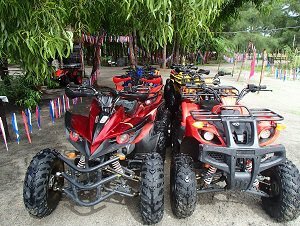 Board your off-road vehicle to go to Brgy. Malomboy. Brace yourself for a very bumpy uphill ride that will last for about an hour. On your ride up you will meet your local guide. 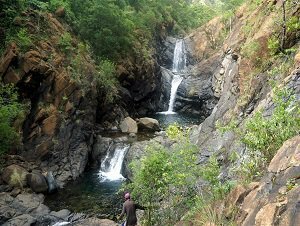 After the exciting off-road land transfer, you and your guide will start your 90-minute hike to Tukal-Tukal waterfalls. Apply your sunscreen. You will be crossing some streams and walking through a tree line then an exposed portion of land before you start going down to the water falls. Make sure that you are wearing a good pair of hiking shoes/ sandals with excellent traction (i.e. no flip flops) as the rocks are slick on the pool area. Enjoy your picnic, have a swim, take photos and relax. At around 10AM, you can start heading back to the vehicle that will take you back to the camp site. Freshen up a little then get ready to rev up your ATV engine as you go across some portions of the lahar field of Mt. Pinatubo. Make sure you have some serious dust mask on as the lahar dust can get thick especially during the dry season. The basic ATV ride will cover around 2.2km. (Note: If you wish to have a longer ATV ride, let us know so we can arrange it for you. Upgrade rates will apply. It will also affect your itinerary/ schedule.). After an adventure-filled morning, have your lunch at the canteen of the campsite. 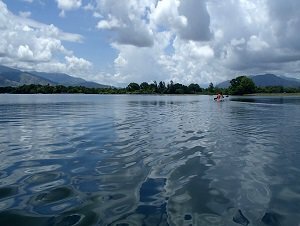 At 2PM, you will head to Bancal river for a relaxed river kayak along the mangrove forests. Depending on your skill and water conditions, this will last for about 1.5 hour afterwhich you will be taken back to the campsite where you can shower and get ready to head back to Manila. If you have your tent you can pitch it at the base camp. Or we also have a basic accommodation, good for 6 people. What else to do/see in Botolan if you stay overnight? ❶ Can we change the sequence of the tour? Yes, it can be modified. Let us know how you want it done and we'll find a way to customize it for you. ❷ Is it possible to spread the itinerary in two days instead of one? Yes, applicable add-on rates will apply. Send us an email for detailed information. ❸ How difficult is the sight-seeing tour? As long as the guests are non-sedentary, it is fairly manageable. ❹ We plan to bring our car. Is there a place where we can safely park our vehicle? Yes! The base camp has a safe parking area. ❺ What pasalubong can we get from Botolan? Lots! If you're there in summer, don't miss the chance to get ripe mangoes - their sweetness is legendary. Best paired with the local suman. ❻ We want to stay overnight at one of the sites (waterfalls, river banks, camp site). Is this possible? Camping at the water falls or at the river banks are not allowed as there is not enough space. However, the base camp has space where you can pitch your tent; also, there are some affordable beach front accommodations in the area for you to choose from.